Millions Like Us, also the title of a 1943 propaganda film set amongst workers in an aircraft factory, features work by Coutts made during residencies in Northumberland (VARC), Japan (Youkobo Art Space) and recently Germany (Künstlerhaus Schloss Balmoral). All involve scenes using non-professional actors, who are at home within the location, though not necessarily within the parts they have been asked to play. In previous work, Coutts has been interested in found images and materials, in how they can be re-worked and re-visited to expose and upset our perception of an original experience. For her second solo show at the gallery, the focus is on the disquieting phenomenon of re-enactment. She re-visits scenes from feature films transposing and adapting them to what seem at first unlikely sites and situations. On a walkway by the Thames and in the ballroom of a German castle, a handful of people dance solo to the sentimental strains of a half familiar tune. The music is played hesitantly. There are a few bum notes. It’s as though the musicians don’t know what they are playing and are struggling to find their way within it; at times the dancers appear similarly awkward, their perspectives entirely inward, as if recalling something only they can reach. In a leafy suburban park a shooting takes place. The plastic stopper on the toy gun is clearly visible, but the victim falls to the ground anyway. In the background, people cycle past regardless. The drama unfolding seems entirely usual to them in this Western suburb of Tokyo’s vast metropolis. Beneath the trees there are thirty people in all, half wearing white hats, half wearing black hats. There is much staring, sizing up and hostile pacing to and fro. The Tokyo scene described above is from Coutts’ film Eastern (2010 7 mins), a partial re-enactment of Sergio Leone’s final confrontation between Charles Bronson and Henry Fonda in Once Upon A Time in the West. Coutts, however, cuts to a different actor with each edit, literally fragmenting the tension of the original. Dog walkers, foresters and youths from the local bars were asked to play parts and re-interpret Morricone’s famous score. The legal battle between Leone and Japanese director Kurosawa over the stealing of stories motivated Coutts to re-site the film within a context of the East overlapping the West. Reminiszenzen der Erinnerung, (Reminiscences of Memory) (2010, 11 mins) similarly contains re-enacted moments from films by Federico Fellini and Hollis Frampton, remembered and recited passages from Jorge Luis Borges and Thomas Mann. However this time they are lodged within a story of Coutts’ own making, tracing the patchy memory of a woman trying to recall the thoughts of a man prone to forgetting. Finally, Passing Place, (2009, 24 mins) is set at a crossroads in a remote part of Northumberland. Local people were persuaded to re-enact scenes from a series of films also set at crossroads. A Llama farmer and a part-time grave digger woodenly portray the respective parts of Tom Hanks and his love interest in Zemickis’ ‘Castaway’ while a family of four appear almost professional, killing each other in their interpretation of Pasolini’s Oedipus Rex. Coutts’ re-workings of films do not necessarily invite further familiarity with the originals. Instead they expose cracks in memory and the fragile individual and collective struggles we experience to both locate them and ourselves. Nicky Coutts studied at Chelsea College of Arts and obtained a PhD from the Royal College of Art. She has just finished a six-month fellowship at Künstlerhaus Schloss Balmoral, Germany and has shown this year in Ha Gamle Prestegard, Norway, Multichannel, Artsway, UK and Doris, Stedefreund, Berlin, Germany. 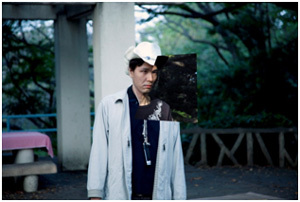 In 2011 she has been invited to make a film at by Youkobo Art Space, Tokyo.